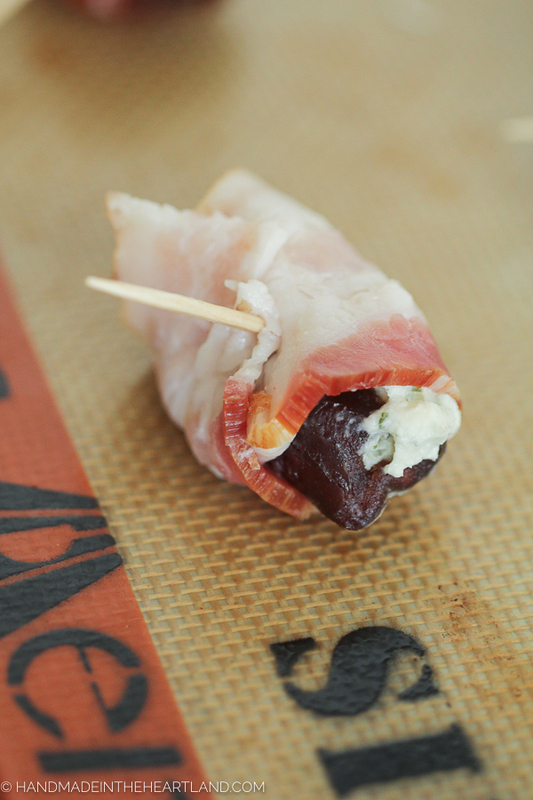 Bacon wrapped dates are the perfect appetizer for entertaining guests, taking to a party or having on your table for game day snacking! GUYS. These little nuggets of goodness are my new favorite appetizer! 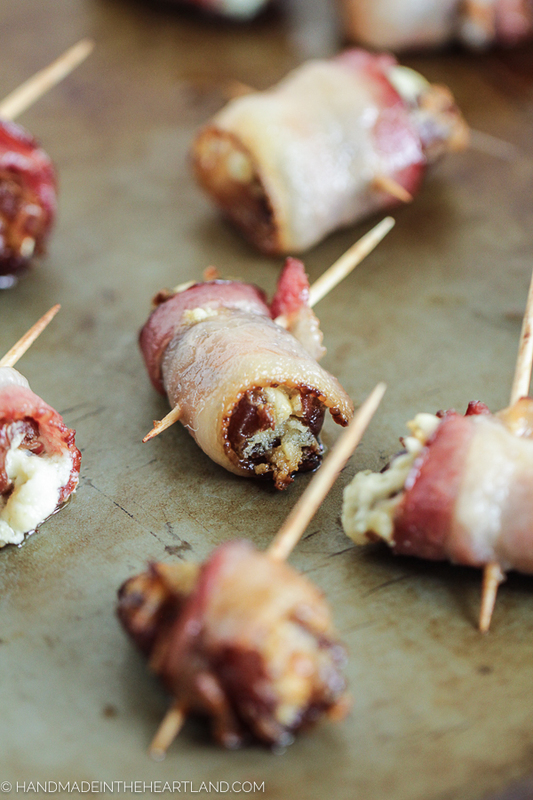 Let’s be honest, anything wrapped in bacon is delicious, but these, these are SO good. I’m still a huge fan of my bacon wrapped jalapeños recipe but there’s something really delicious about sweet and salty together and the date-bacon combination has me totally in love. Early this summer I enjoyed a lake weekend with some of my closest friends. We went to Tablerock lake on the Missouri-Arkansas border and for dinner one evening we made a little trip over to Bentonville. We ate dinner at a fantastic little restaurant which I don’t even remember the name of and this was one of the appetizers. As soon as I put one in my mouth I knew I was going to have to go home and replicate them! I’m a huge fan of blue cheese which I feel like is a total adult thing to like. I hated it as a kid and so did my husband but now we are all “give me all the blue cheese all. the. time.”! Do you like blue cheese? If so, did you like it as a kid? For these appetizers and literally everything else that goes in my oven I used my Silpat. Because it’s a lifesaver. Head on over to THIS post to read why I love my Silpat! 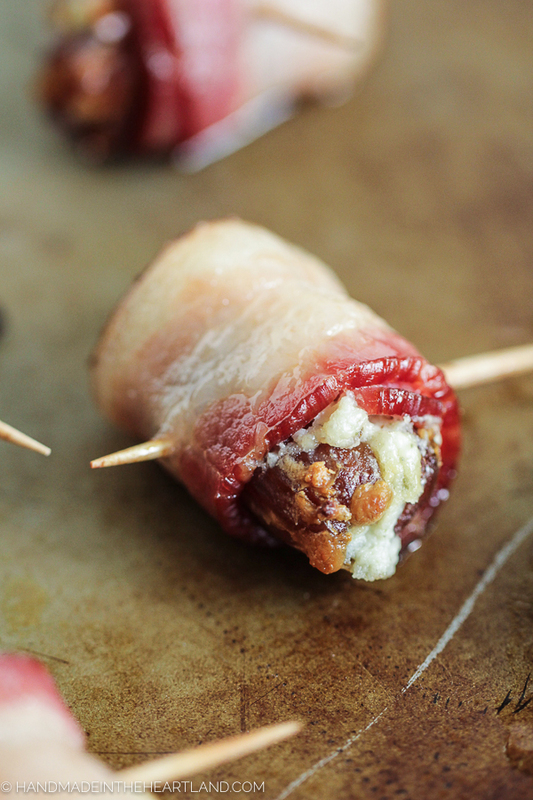 I’m not going to tell you that this is an appetizer you can whip out in 10 minutes. 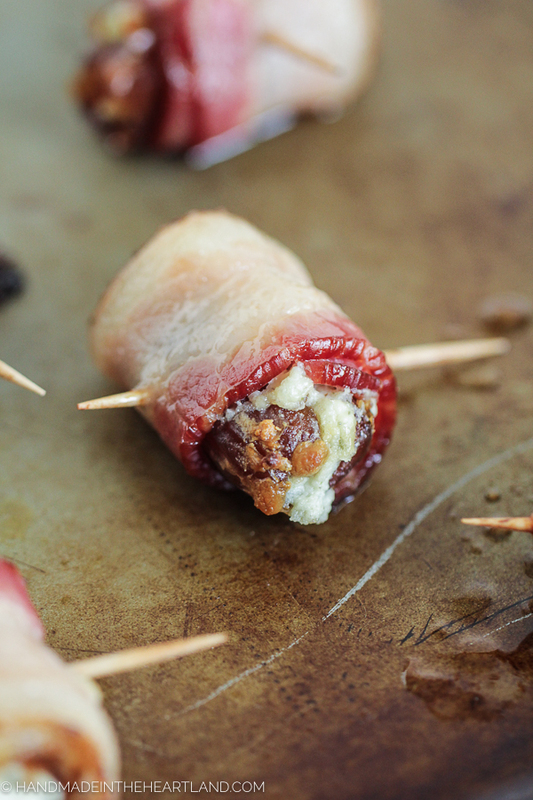 I mean you have to stuff each little date and then wrap it in bacon, it’s not for the faint of heart. BUT it’s worth it! I promise! They are sooooo good!! So next time you get invited to a party- maybe during the holidays- and you wan’t to wow your friends, take these! They are different, I bet most people will not have tried such a combination before and I guarantee they will love them! When you make them will you please snap a pic and share it with me?! 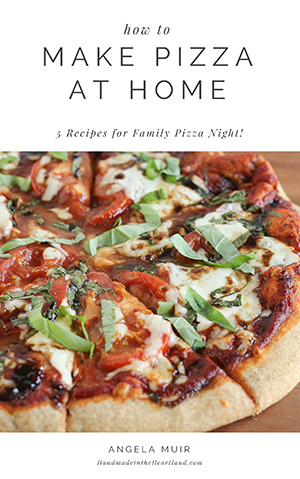 It makes me so happy to see you enjoying recipes from this here blog. I’d love to hear in the comments or tag me on Instagram (@handmadeintheheartland) or Facebook! A perfect appetizer for a party, game day entertaining or to take to an event! 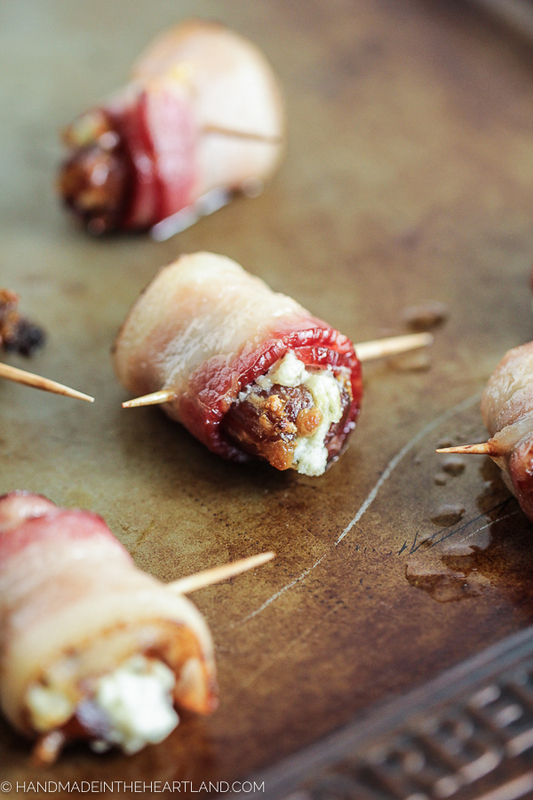 Bacon wrapped stuffed dates are the perfect sweet and savory appetizer to please everyone at the party! Preheat the oven to 450. Make the filling by mixing your blue cheese crumbles and boursin spread together until well incorporated. On one side slice each date lengthwise so you can open it and spoon the filling in. 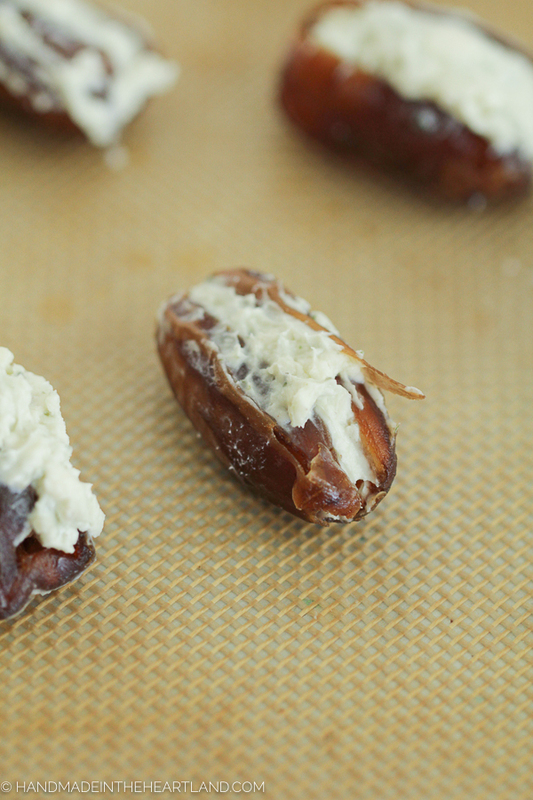 Fill each date with cheese filling. 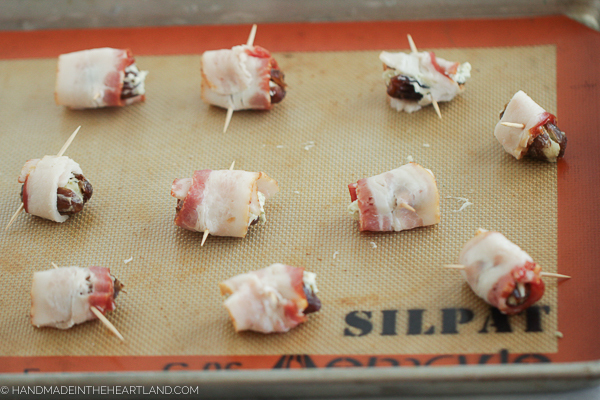 Slice your bacon into 3rds lengthwise so you can wrap 3 dates from one slice of bacon. Using toothpicks secure the bacon once you’ve wrapped it around the date. 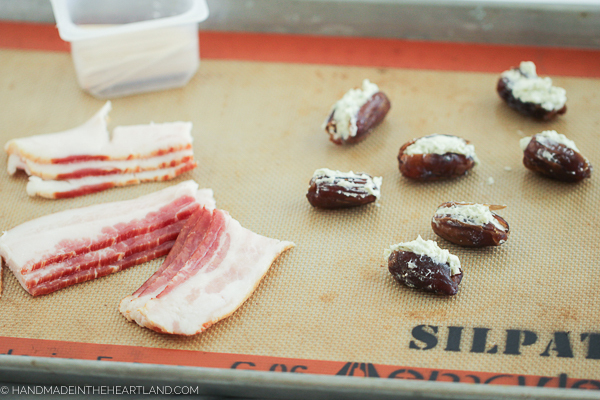 Place the dates on a silpat lined baking sheet and bake for 10-15 minutes or until the bacon is fully cooked. Need to save the recipe for later? Pin the image below!